By Andrew Porter: This is a photo I took back in 1966, after a party at Ted White’s apartment in Brooklyn, en route back to civilization, uh, home, for TAFF winner Tom Schlueck, now a famous German literary agent, and a guy who got a black eye in fannish circles for never doing a TAFF report. From left to right, we have Jock Root, Schlueck, Terry and a sleeping Carol Carr, and Gary Deindorfer. Miller High Life (the champagne of Bottle Beer) has a starring role, plus ads for Sominex, a sleep aid, and the famous Meet Miss Subways ad — pick one of these beautiful girls for the honor. I can’t figure out what the ad on the left is for. As an added bonus, we can see a “Women” tiled doorway on that station platform, from those forgotten days of last century when, maybe, you could actually go into a room in the subway station to go to the bathroom, instead of the unthinkable alternative of relieving yourself directly onto the subway tracks (men only). This photo was taken so long ago it’s before NYC’s teenaged hoodlums had thought of graffiti, or before they invented spray paint and markers. Maybe both. 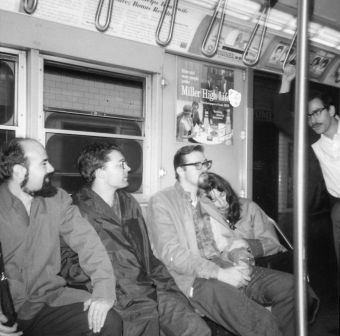 It’s also way before the subway cars were air-conditioned.